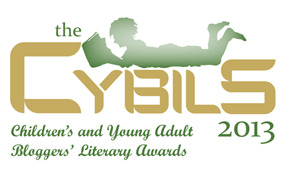 I'm very excited for the start of the CYBILS Awards this week. Anyone may nominate a book they think is an excellent book for children and young adults. So start thinking -- what would you nominate? Check out the Cybils FAQ for more guidelines. The description of the Book App Category can give you more information as well. Once again: NOMINATIONS run from OCTOBER 1st-15th. You should definitely nominate your favorite books that were published in the last year. Head to the CYBILS site to find out more information. I often wonder about how to encourage my kids to learn more about current events. We don't watch the TV news in the evening the way my parents did, and I primarily read the newspaper online. At school, they read the Scholastic News but it doesn't really engage them. So I've been super-excited to see kids' reactions to a new app: News-O-Matic -- a daily news app for kids. News-O-Matic, named one of the Best Apps for Teaching and Learning in 2013 by the AASL, presents the news specifically written for kids ages 7 to 10. It's an engaging, interactive digital newspaper for elementary school kids. Each day, they publish five articles on the day's news. My students feedback: two thumbs up! The writers at News-O-Matic really understand kids. They know that kids want lots of funny, interesting news articles, along with some what adults might think of as "real news." Take a look at a page from last week: it's fun, colorful and draws you right in with engaging images. They have mixed high-interest articles on sports with international events in Italy and Kenya. Each news article is written specifically for kids by the Press4Kids writers. It's clear and engaging, but I particularly noticed how the articles are age-appropriate for elementary students. For example, you can see here that they write about national tragedies like the recent flooding in Colorado, but they focus on rescue attempts. Each article is reviewed by child psychologists before publication to ensure content is age-appropriate. News-O-Matic releases a new issue each day. As a teacher, I subscribe to their PDF edition. My daughter will often say to me, "I want to check the news today." I'm happy as can be that she's wanting to read the news, even if she's drawn to the silly, goofy articles as much as the tragedies -- that's absolutely what I'd expect from a nine year old! I've noticed that kids are much more drawn to this interactive news app than the traditional news flyers distributed in the classroom. They love the interactive map with quirky facts. They like being asked to rate articles. And the additional layers of photographs and videos are a big draw. This app is one of the twenty five selected by the AASL Best Apps for Teaching and Learning, 2013. I have loved participating with this committee. If you're interested in apps, definitely check out their whole list of recommended apps! I've been very impressed with Press4Kids' technical support as I've worked to get my apps working at my school site, dealing with the frustrations that web filtering can cause. The best historical fiction sweeps me up and transports me to another world. 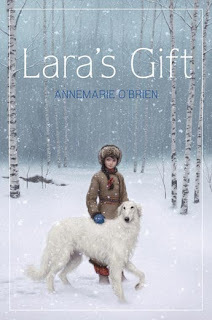 With Lara's Gift, Annemarie O'Brien carried me away to tsarist Russia, to the life of a young girl living on a nobleman's rural estate helping to raise famous Borzoi hunting dogs. This novel will engross children who love historical fiction, especially those who connect to characters trying to stand up for themselves. Young Lara dreams of becoming the next kennel steward, following in her father’s footsteps raising prestigious borzoi dogs on Count Vorontsov’s countryside estate. When her mother has a newborn son, Lara is caught between honoring her family’s traditional values and her own dreams. Suddenly Lara’s father suggests that she should stop spending time with her beloved dogs and learn skills that would be more useful in finding a husband. Lara has a deep connection to the borzoi, especially her beloved Ryczar, and will go to great lengths to protect them - especially against ferocious wolves. Readers will be swept along by the challenges Lara faces as she struggles to convince her father that she should be able to become the next kennel steward, raising borzoi dogs worthy of the Tsar. In her debut novel, Bay Area author Annemarie O’Brien takes readers into the world of a Russian noble estate in 1914. O’Brien weaves in many historical, cultural and linguistic details to create a fully realized setting, without overpowering the story. A sample preview of Lara's Gift is available through Google Books. Right from the beginning, I was immersed in Lara's life on a rural Russian noble estate caring for her beloved dogs. I was especially interested in O'Brien's author’s note providing interesting background on her interest in borzoi dogs, Count Vorontsov’s famous kennel, and other historical aspects of this story. 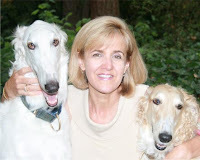 Readers will get a full sense of her appreciation of both the Russian culture and the wonderful borzoi dogs. The review copy was originally received through ACL, the Association of Children's Librarians of Northern California, where I originally published this review, and subsequently also sent by the publishers, Random House. If you make a purchase using the Amazon links on this site, a small portion goes to Great Kid Books (at no cost to you!). Thank you for your support. One of my favorite memories has to be watching little kids go to the local fire station for the first time. They look up at the huge fire fighters and their trucks in such awe and amazement. Laura Murray has created a rollicking fun read aloud to celebrate this adventure. The pint size hero of The Gingerbread Man Loose in the School returns for a class field trip to the local fire station. 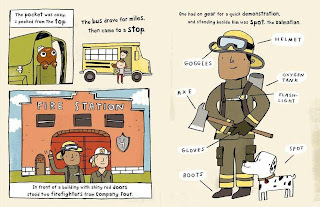 After their teacher announces they’ll be riding the bus to meet the fire fighters, Sophia reassures the Gingerbread Man that she can take him along in the pocket of her backpack. The ensuing chase leads throughout the fire house, into the truck, up the shiny pole, through the bedroom and into the kitchen. 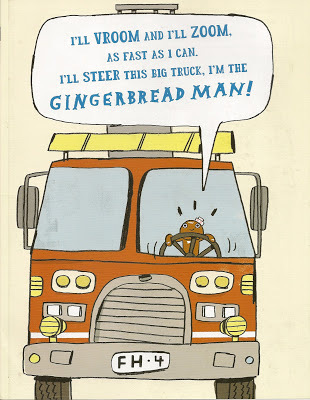 When the alarm sounds, the fire fighters rush to the truck and the Gingerbread Man hops aboard, riding to the rescue. 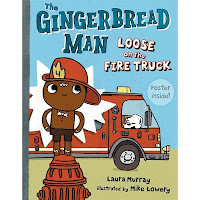 Murray’s bouncing rhythms keep the story moving at a quick pace, and are matched by Lowery’s action-packed cartoon-style illustrations. 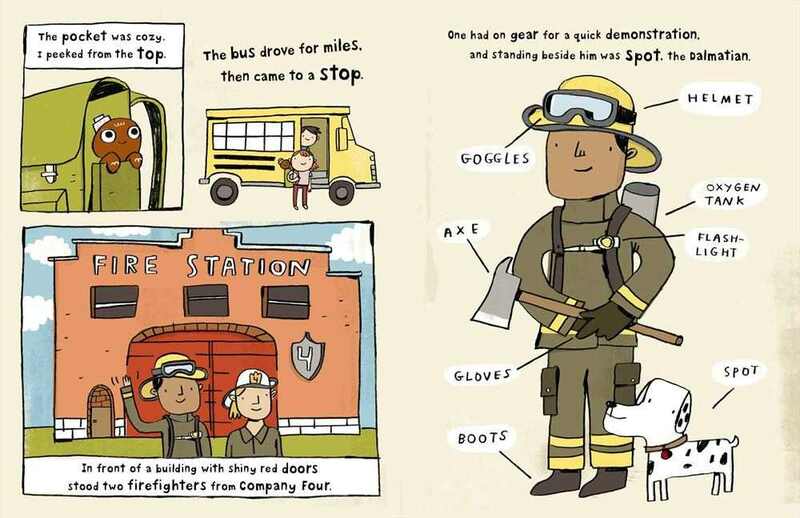 In the end, female Fire Chief Anne rewards the little hero and his classmates with helmets, paralleling many children’s own trips to the fire station. Read a fun interview with Laura Murray over at Mr. Schu's Watch.Connect.Read. What a great school visit this would be! The review copy was kindly sent by the publishers, Penguin Books for Young Readers. If you make a purchase using the Amazon links on this site, a small portion goes to Great Kid Books (at no cost to you!). Thank you for your support. As we celebrate Constitution Day on September 17th, we need to draw our children into the essential question one of my students asked last week: How is our constitution relevant today if it was written so long ago? Spur their interest with the contradictions inherent in the way the Constitution treated African Americans, but also show them how it protects their own rights today. 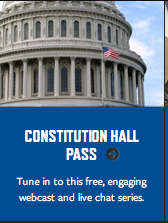 Today I'm sharing resources I've collected that will help middle school and high school students explore the way the Constitution establishes basic structure of our government, the responsibilities of each branch of government, and the basic rights afforded all Americans. 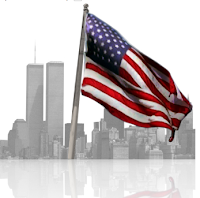 I'd like to end by sharing this video produced by the National Constitution Center. I found it a very effective way to bring students into thinking about what rights the Constitution guarantees that matter to them. Today. Right now. Federal law requires that all schools receiving federal funds hold an educational program for their students on September 17th. Yesterday I shared resources that are more appropriate for younger elementary students. I'd love to hear about resources you like to share with students to help them think about the importance of our constitution. Next week, Americans celebrate Constitution Day and honor the signing of the U.S. Constitution. I've enjoyed finding resources that help students and teachers explore the Constitution, and wanted to share them here. This year marks the 226th anniversary of the signing of the United States Constitution. This document establishes the basic structure of our government, the responsibilities of each branch of government, and the basic rights afforded all Americans. PRIMARY -- young students (gr. 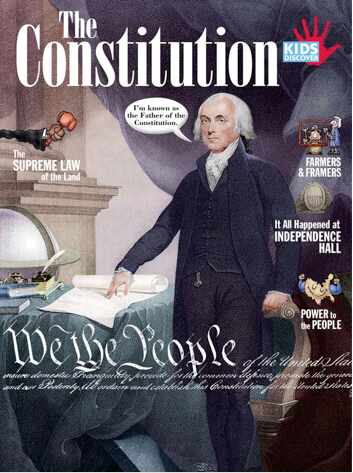 1-3): These resources help introduce the Constitution to young students for the first time. ELEMENTARY -- middle grade students (gr. 4-5): These resources help kids (ages 9 - 11) explore the basic ideas in the Constitution. Tomorrow I'll share resources for middle school and high school students, grades 6 - 12. They will include more primary resources. I'd love to hear about resources you like to share with students to help them think about the importance of our constitution. Gennifer Choldenko's series of historical fiction novels set on Alcatraz Island have a large and loyal following in our school. It could be that we can see Alcatraz from nearby streets. But I'm sure what really draws kids to this series is Choldenko's blend of friendship stories and family struggles, with plenty of humor and heartfelt moments. 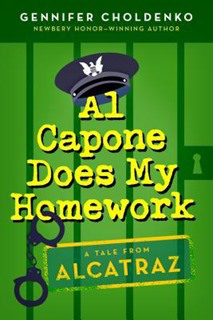 This month, Choldenko concludes her trilogy with Al Capone Does My Homework. I'm terrifically pleased that my students will love this series finale as much as the others. In the beginning of these stories, Moose Flanagan and his family move to Alcatraz when his father goes to work as a guard at the notorious prison in the 1930s. Now in January 1936, we find Moose Flanagan trying to figure out who set fire to his apartment. His father has just been appointed associate warden on Alcatraz. Could the fire have been set by an inmate who’s trying to get revenge? Another guard who’s jealous that Moose’s father was promoted? Or did Natalie, Moose’s sister who has autism, really set the fire as so many on the island are claiming? Moose is a character who sinks into my heart. He's earnest but a real kid, one who struggles with his feelings. He's funny, but also thoughtful. He defends his sister Natalie to everyone, but harbors doubts inside. Best of all, my students really connect to him and enjoy reading about his adventures. Scheuer: Bay Area kids have loved the Alcatraz setting in your Al Capone books. How did you first think about setting a book on The Rock? Choldenko: It actually started in 1998. At that point, I had published one picture book, and I was looking for an idea that might be different enough that it might get an editor’s attention. I saw an article in the San Francisco Chronicle about kids who grew up on Alcatraz because their parents were guards or worked on the island in some capacity. As soon as I saw that, I knew I would write a book about a character like that, because it seemed like so much fun. Right away I signed up to work on the island as a volunteer, so I could get the experience as firsthand as I could make it. Scheuer: As kids read about Moose’s relationship with his sister Natalie, who had autism, what do you hope they will think about? Choldenko: I always start out writing a good and true story. I hope kids will respond to that. I don’t try to send a message so directly. Moose comes in part from my brother, because my brother was better at dealing with our sister who had autism than anyone else. To this day, I really admire my brother because he has the biggest heart of anyone I’ve met, and some of that comes through. Definitely click through to read the whole interview over at Parents Press. You'll also find a wonderful assortment of resources at the Al Capone Does My Shirts site. The review copy was kindly sent by the publishers, Penguin Young Readers Group. If you make a purchase using the Amazon links on this site, a small portion goes to Great Kid Books (at no cost to you!). Thank you for your support. When I look for a great counting book, I am looking for a book that pulls young readers back to read it again and again. It has to have clear, dynamic illustrations and text that invites the adult to interact with the child while they read together. 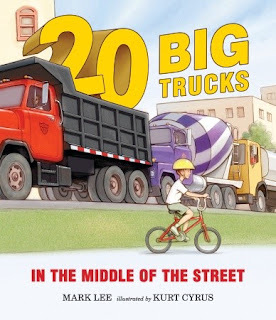 Mark Lee's debut picture book Twenty Big Trucks in the Middle of the Street is a fantastic new counting book, perfect for little kids wowed by huge, towering trucks. A little boy watches as an ice-cream truck rumbles down the street. When the ice-cream truck breaks down, it blocks middle of the street. This leads to a chain-reaction traffic jam, with truck after truck getting stuck in the street. Lee's rhyming text is wonderful to read aloud, adding interest for parents and children. He uses the page turns perfectly, building suspense along the way. "A mail truck stops, so now there are two. Their drivers don't know what to do. Watch out! Two trucks are in the way. They stop a third truck carrying hay." 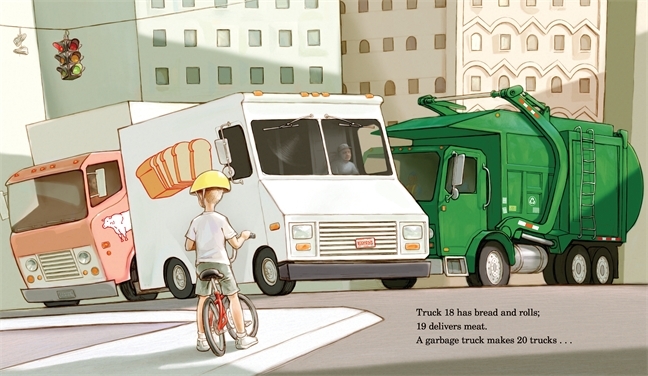 We start realizing the pattern just as the little guy on his bike starts counting the trucks. Kurt Cyrus, veteran picture book author and illustrator, captures our attention with bold digital illustrations. I love how Lee and Cyrus each layer in many aspects to this counting book, inviting repeated readings. Some kids will spend hours naming each type of truck, while others will notice all of the different items the trucks carry. 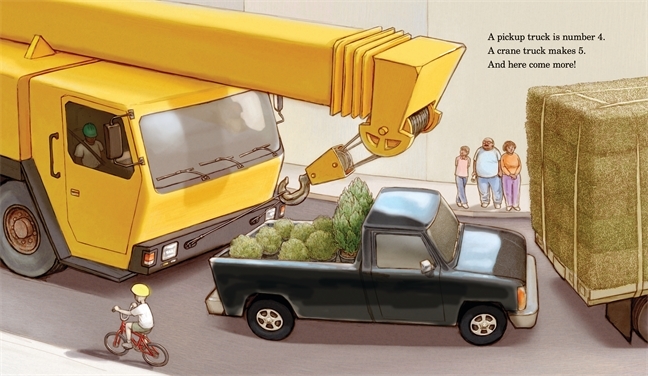 Cyrus keeps the little kid on the bike as part of each picture, helping kids see themselves in this busy traffic jam, but he switches up the perspective throughout, zooming in and out of the scene. 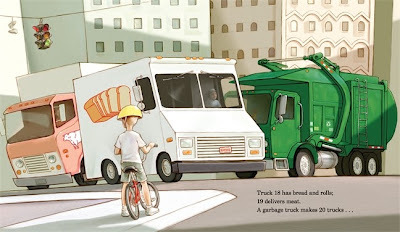 My favorite spread is near the end, looking down at the whole big mess, when you can count each truck that's piled up waiting for the ice cream truck to move. Best of all: the little kid comes up with the final solution! The review copy was kindly sent by the publishers, Candlewick Press. The illustrations are copyright ©2013 Kurt Cyrus, share with permission of the publisher. If you make a purchase using the Amazon links on this site, a small portion goes to Great Kid Books (at no cost to you!). Thank you for your support. 20 BIG TRUCKS IN THE MIDDLE OF THE STREET. Text copyright © 2013 by Mark Lee. Illustrations copyright © 2013 by Kurt Cyrus. Reproduced by permission of the publisher, Candlewick Press, Somerville, MA. Labor Day has a special meaning for our community here in California. Today I would like to honor the brave work of Dolores Huerta and Cesar Chavez in leading the farm workers' struggle for human rights and fair treatment. 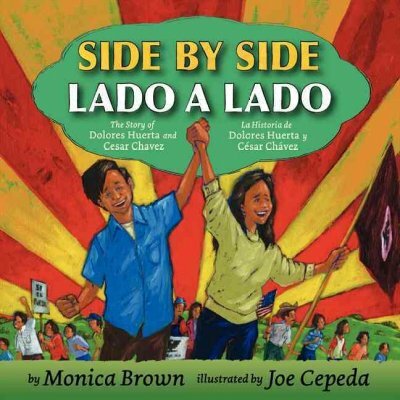 Monica Brown and Joe Cepeda's book Side by Side / Lado a Lado introduces these remarkable leaders to young children, focusing on their courage, bravery and integrity. Dolores Huerta and Cesar Chavez each brought their own passion and backgrounds to the farm workers' struggles. Huerta moved to California as a young girl and learned from her mother to always think about others. As a teacher, Huerta "saw the farmworker children come to school cold and barefoot, too hungry to learn as well as they could." Cesar Chavez watched as his family lost their home in Arizona, moving to California to become migrant farm workers, following the crops. His life was difficult, working in the hot sun picking lettuce, strawberries and grapes, suffering when owners sprayed crops with pesticides while workers were still in the fields. Brown and Cepeda show how Huerta and Chavez came together to invite farm workers to join la causa, demanding better working conditions. The simple text, in both Spanish and English, emphasizes how they worked together as co-founders of the United Farm Workers union, organizing the National Grape Boycott and the historic march to Sacramento. Joe Cepeda's illustrations really shine through in this picture book, bringing energy and conveying a sense of Huerta's and Chavez's passion, determination and joy in their work. Throughout, this book is filled with the sense of "¡Si, se pueda! Yes, we can!" For more Labor Day books, check out the recommendations by The Nonfiction Detectives. They have several resources that would make great complements to Side by Side. One aspect I really value in the Common Core standards is asking students to read multiple sources about a topic. I look forward to checking out some of these other books for young children on the labor movement. The review copy was kindly sent by the publishers, HarperCollins. If you make a purchase using the Amazon links on this site, a small portion goes to Great Kid Books (at no cost to you!). Thank you for your support.